The first day of "running" on the C25K program after working a full night at the hotel felt terrible. I could barely huff it out for 30 seconds before I felt like my heart would explode, and I had to do ten intervals. Running on concrete felt nothing like running on an elliptical – so much tougher. Wth the race looming, I managed, since I didn't have much choice. Worse, my feet and legs absolutely killed afterward – I could barely walk. Active friends, including Steve, and Adam and Lauren, two running friends in Chicago who absolutely supported my decision to start running, ordered me to buy new shoes, that day. As a cheapskate, I had used the same $35 cross-training shoes that I'd had for about a year already. I made my way over to Fleet Feet and threw down for the most expensive pair of non-dress shoes I'd bought in my life, a pair of Brooks GTS 11 Adrenalines, just based off the salesman's recommendations. Paying $100 for shoes felt more than slightly ridiculous, but if it would let me walk normally after jogging, well, it was just money. To my extreme relief, Lauren later said she owned the same pair of shoes. The C25K program got easier, though it never felt easy. Luckily, I lived in an area of Chicago, Logan Square, well-suited for very short runs – lots of tree-lined boulevards and side streets that I could run through without stopping for traffic. Running after work made the most sense to me, since doing it beforehand would mean I'd have to stand for eight hours after smashing my legs up. When I tried, that did not turn out well, nearly passing out on my colleague a few times – running in the mornings, sometime between 8-12 hours after waking up, was the way to go. I put my social life more or less on hold to complete the program, but still squeezed enough in to not go nuts. I had a decent start on overall activity due to being a kind-of-frequenter of the gym, so it got easier and faster, once over the first hurdle. I was able to complete the C25K in about six weeks, as opposed to the prescribed nine. Suddenly my goal went from simply finishing to actually doing decently in the run. That was a bit of a shock. Still, I didn't see myself taking up running as more than a casual thing. I went to support Lauren as she ran the Chicago Marathon (and left before seeing her – I failed to consider her starting corral and pace) and marveled. I thought I could never attempt anything longer than a 5K. I was extremely excited for the race, and went out to Grant Park that November morning to do the best I could with 30,000-some-odd other runners. My aunt Randie, who'd been a hotel manager and knew a bit about running and cycling, had served as a confidant and advisor for months, another key assistant with my progress. Randie happened to be in town that week, so she joined me. It felt fantastic to be accompanied by someone who would be there to help document the event and support me, regardless of result, and helped me remain calm beforehand. I found out the morning of the race that Scott had hurt himself with a minor injury, so he and Natalia, a more seasoned runner, would be taking it easy. That didn't sit well with me, having trained for the event and hoping to have a decent time. Being the bit of a jerk I was at that moment, we started together, and I wished them luck – and promptly bolted ahead. During the C25K sessions, I'd made injury avoidance a main priority. Thus, it served me right that I injured myself for the first time about a mile into my first 5K. The Hot Chocolate course was ridiculously crowded, and walkers swarmed everywhere in chains and families, having disregarded the regulated system of corrals. Weaving through groups of people was the only way to get ahead, so I veered left, jumping up and down from the sidewalk, running under the El tracks on Lake Street. On one unlucky stride down the curb, my right foot landed in a pothole, and my ankle rolled. Shot of excruciation. Screaming. Biting down and holding back tears. It hurt, badly, but dammit, I had promised myself, WHATEVER HAPPENED, I WOULD NOT STOP. So I kept going, and fought off the pain. I absolutely asked myself once or twice why the hell I thought it was a good idea to run, period, hating myself for it. Within a few blocks, it was numbed, which was good, right? Surely the adrenaline eased the intensity of the pain after I got over the shock. I finished the race as best as I could and ended with a time of 31:39 – then nearly proceeded to slam into a wall of other runners. The logistics of the race were terrible, and people were practically stuck in the chute leading ahead. Not a great time for the ankle pain to hit – but it did right then. I realized that I could barely walk, and I had ended up on the other side of a line of several thousand people from the medical tent. Some weeks beforehand, I'd reached back out to Mary, letting her know I planned on doing C25K and running the race. To my shock, we ran into each other as I was stumbling, and she helped me over to the medical tent. I got fixed up by the nurses – no, your ankle is not broken; yes, it’ll recover fine – and that was that. Running into Mary at the end of the race made for a fine moment of reconciliation despite now living in different states, and it was remarkable that the timing worked out so well. From that point on, Mary now began giving me insights into running, and was, along with Steve, one of the most qualified people to give detailed, personalized advice on how to proceed, which proved an incredible help. Despite being in physical pain, finishing that race exhilarated me. Until this point, I'd thought of running as a way to lose weight and get fit. Being informed by a trainer a few weeks into my own C25K progress that running would make losing weight actually much more challenging compared to other activities slammed me hard, but perhaps surprisingly I stuck it out, faced with that immediate goal of the race. I assumed that once I finished the Hot Chocolate, I'd feel satisfied with the results, proof I could improve my endurance, and end it there. Unexpectedly, in the wake of my first race, I wanted to run another. Within two weeks, positive that my ankle could withstand another race, I signed up for one more 5K. 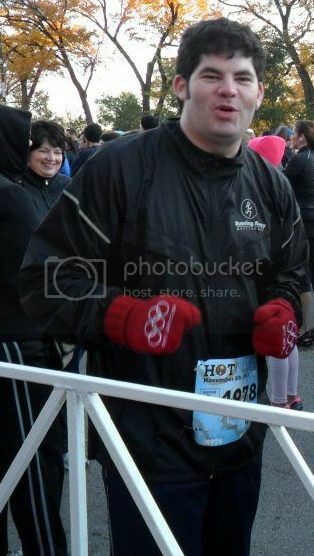 This time, during the North Shore Turkey Trot 5K in Highland Park, IL, I ran with Steve, who had come to town for the holiday. He ran along at my pace and urged me on, even when I felt like I couldn't move any faster. It was another great experience ... except that the timed bib failed to work. Fuming afterward to my uncle, I said it felt like a wasted effort without an official time. My uncle, who'd run several marathons in his lifetime, simply asked me, "Why do you run?" Apparently, I'd never really considered that question before ... and it still stands as a question that I struggle to answer at times. It seemed that running became another sort of activity picked up by my inertia, but at least this time it felt like a healthier thing to get stuck on. Tomorrow: part five, Matt keeps running, and learns about nutrition. Last night my friend randomly asked me if I wanted to run a 5K with her. I said yes, despite not ever having run one, and now I'm a little more confident I can do it and might actually enjoy it. I admire you so much for getting out there and running a 5k. I am not at all athletic and I always use that as my excuse for why I don't run. The truth is that I'm afraid of failing at something else, something that so many people do and I use the other to not seem like a wuss for not running. Your story Matt, has given me the courage to give running another try. Thank you for sharing it with us. Wow. That is a really good time for your first 5K, especially with a twisted ankle. @bailey,sarah, and jen, thanks! i realized afterward that i'd done pretty well - it helped that i'd been working out sporadically for about nine months beforehand, i was more prepared for running than i realized. @bailey, just do your best. you're guaranteed to have a better time than you would if you were sitting on the couch. the first step is the most important! @jen, TBH mary probably can answer that better than i can, but i'd imagine it has to do with the body requiring quite an increased amount of nutrient, particularly carbohydrate, to fuel itself... it's hard to fight off hunger and easy to overeat, in my experience. i wasn't happy to learn from a trainer that, in the six months + that she'd run, she only lost 8 pounds! @texancountess, my pleasure to share, and my greater pleasure to help encourage and inspire you. you don't need to be athletic, just give it a shot! you really can only fail by not trying. Six miles is far. Way to go! Been reading along the previous entry but just now got an opportunity to comment. Thank you for sharing your story. I look forward to reading more about you. Kudos for sharing this part of yourself. It's hard to put yourself out there but I think you will find an immense amount of support. And finishing a 5K with that time while injured, well that is just awesome!